As I mentioned in a previous post, I've been hoping to make mulberry jelly, exclusively from my own tree. 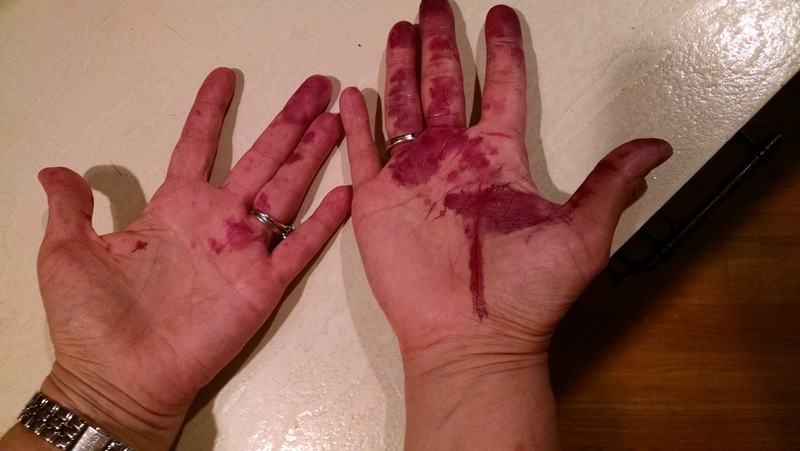 Well, I managed it, but it took about a week to get enough mulberries to do it. Every time I got a bunch of berries, I juiced them and saved the juice. As of tonight, I finally managed to get 4 cups of juice. The mulberry juice was mixed with 3 T. lime juice, 1 package powdered Sure-Jell pectin, and 5 cups of sugar. Processed the usual way, this yielded 7 cups of jelly. I'm setting aside 2 jars to enter into the Fair, in the "other jelly" category. Two years ago my Rose Hip Jelly got an honorable mention in that category. So far, I have 2 entries set aside - this and the strawberry jam. Yesterday I had my family over for a BBQ. Well, since it was raining the whole time, it was more of a sit down meal that involved the grill. Regardless, in the spirit of BBQs we had hot dogs and sausages (mostly German, and all from Karl's Sausage Kitchen, truly a hidden gem in our area), pickles, sauerkraut, various salads, fruit and a pie. Of all that, these were the home canned items: pickled carrots, dilly beans, dill pickle spears, sauerkraut, and green tomato ketchup. I made another batch of that strangolopreti dumpling, with kale and arugula this time. They came out different and I'm not sure why - maybe the bread wasn't soft enough, not sure. Maybe the kale wasn't chopped finely enough. Still, they were popular, and went quickly. 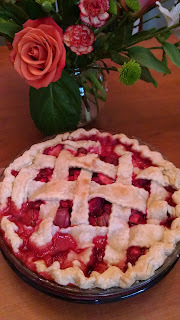 Also, I made the pie. (Of course!) 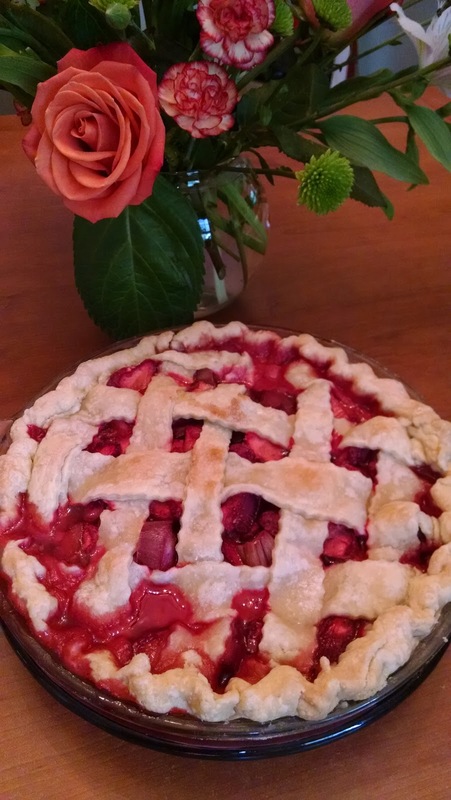 In the morning I got it baked and made a bonus strawberry tart as well, which was breakfast. Despite the cornstarch the pie was very runny - I might have to use tapioca next time - and I think maybe I didn't bake it long enough because some of the rhubarb was a little tough. Still tasted pretty awesome, even if we had to eat it in bowls. Bright and early this morning my family went strawberry picking. Some of us were more chipper about it than others. It was a gorgeous morning and in a very short amount of time we picked 17 pounds of strawberries. Yes, 17. I've done this before. But because of the weather these berries were not going to last even 24 hours. I had to get them "processed." Today. In 8 hours I made: 1 batch strawberry jam (which is better than the previous batch so I think I'll enter this one in the fair, not the other), 1 batch strawberry margarita jam, 1 batch strawberry rhubarb jam, 1 batch strawberry jalapeno jam*, 1 batch strawberry lemon marmalade, 1 batch strawberries with sugar for another shortcake, a chocolate shortcake for said strawberry shortcake, a pie crust, set aside the strawberries and rhubarb for the filling (I'll roll out the crust and bake the pie tomorrow), washed some for eating now and refrigerated the rest (about a quart) for smoothies tomorrow. Also, I picked whatever mulberries I could off our tree, as there is a storm coming through and they're all going to get knocked off anyway. And my husband and I assembled new patio furniture. *There are a couple of people in my life who love the strawberry jalapeno jam so much that whenever I make a batch I set aside a jar for each of them. Not that it lasts long. One of these friends can eat the entire 8 ounce jar of this jam in 5 minutes. Straight. Just with a spoon. I've seen her do it. No, not together. That would be silly. Yesterday's farm share distribution included more strawberries (2 quarts) and more garlic scapes (16) which, added to the previous distributions, meant I had about 40 garlic scapes and clearly not enough time to use them. Since I still had garlic scape pesto in the freezer, as well as chopped scapes, I decided to pickle them using the recipe in Preserving By the Pint. I had enough scapes to make 3 jars instead of 2, and they're in the canner right now. When I went to the farm yesterday, I brought the 13 year old, who was the one who picked all the berries. 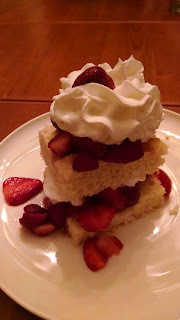 The request was for a strawberry shortcake, and I obliged, of course! This time we remembered to take a photo before we inhaled the shortcakes. That was dessert last night and breakfast today. Mmm. The rest of the share consisted of broccoli, kale, arugula, Hakurei turnips (we'd just finally finished the ones from the previous 2 weeks), Napa cabbage, dill, cilantro, snow peas, snap peas, shelling peas and fava beans. As soon as I got home, I blanched the fava beans and marinated them and they'll be good on a salad. We also shelled the peas and they were part of dinner last night, mixed with leftover corn and tossed with some of that champagne vinaigrette I'd made earlier. I also made these: strangolapreti (courtesy of Hank Shaw's blog post) using some of the arugula and the rest of the komatsuna greens. Even the rabbit gives us a dirty look when we try to feed him the komatsuna. Made into a dumpling it was much more innocuous. The dumplings are tasty and filling and not hard to make. What a great recipe! The plan for tonight's dinner is to make a fish stew with the walleye bits I'd frozen after we went fishing last summer. I will use a pint jar or two of tomato sauce, the fresh cilantro, and whatever else I feel like tossing in - I'm going to wing it on this one, I think. Also I'm still working on getting enough mulberry juice for a batch of jelly - I have 3 cups so far and need one more. Our mulberry tree is in full production mode, and I'm hoping to be able to make a batch of something without having to resort to the tree on the corner of the block. It'll take a few trips, I think, as I was able to get 3 cups of plump berries today and there are still tons more waiting to ripen. My husband and I have decided we don't really like the texture of the berries in jam, so I'm trying jelly instead. 3 cups of fruit, simmered and crushed with a little water, made 1 cup of juice. I need at least 3.5 cups of juice. I'll be doing this again in a few days. If you think this looks bad, you should see my jelly bag, which is now rather purple. Despite soap. Today it was time to finish the maraschino cherries: drain the syrup (save it! ), boil the syrup again, add 1 ounce of almond extract, and pour back over the cherries, then process them for 20 minutes (pints, 25 for quarts). I had a lot of syrup leftover and 2 thirsty children. It's 85 degrees and humid outside. I thought about shave ice. For each of us, I filled a glass with crushed ice, then ladled the cherry syrup over the ice until the glass was full. It's very potent! (Hence the title of this post.) When I asked the kids if I could ditch the rest of the syrup, they said no. So I'm canning that, too. One quart and one pint. 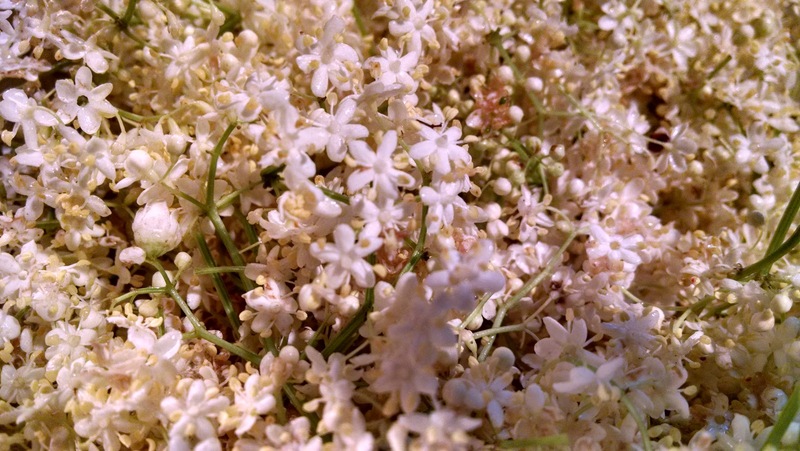 Now I know how to use all the elderflower cordial, too. 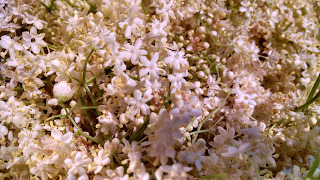 Yesterday, in the pouring rain, I gathered up elderflowers with the intention to make elderflower cordial. Yes, I was completely soaked, particularly because I waded through hip deep plants to get to them. Hopefully, I won't develop poison ivy; at one point I looked down and discovered I was standing in some! The recipe requires 20 or so heads of flowers, 2 lemons, and about 5.5 pounds of sugar. I made the syrup and let the flowers and the lemons steep for a day. Today I strained the syrup and canned it: 10 minutes in the boiling water canner, then rest for 5 before removing. I have to say, maybe the fact that I picked the flowers in the rain made them less fragrant, or washed the pollen off, or something, as I really think I made lemon cordial. It's pretty yummy, regardless. Also yesterday, I started a batch of maraschino cherries: 4.5 pounds of cherries, pitted and brined overnight. Today I made a syrup with 4.5 pounds of sugar and 3 cups of water plus the juice of one lemon. The cherries are now soaking in the syrup and tomorrow I will can them. I left out the red food coloring this time, on purpose, because I thought they would likely look fine without all the extra red dye. Not splitting the farm share is usually mildly dangerous - I end up with way too much food and a finite amount of time with which to cope with it. Sometimes, though, it's good to not have to split the share. This time of year, as the farm is ramping up, the share is enough for a couple of meals rather than one, and the strawberry distribution is fairly generous. This week, the strawberry distribution was FOUR QUARTS. No kidding. 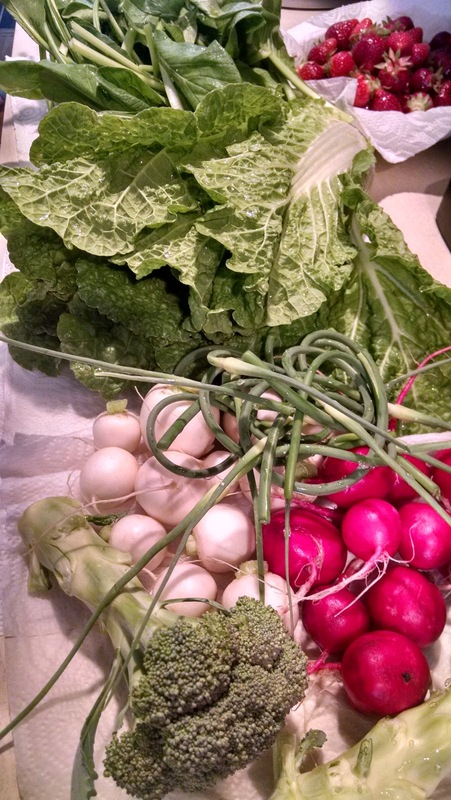 Here's the rest of the share this week: 1 bunch Hakurei turnips, 3 stems of broccoli, 1 bunch Komatsuna greens, 0.75 pounds of fresh spinach (more than you might think), 8 radishes, 14 garlic scapes, 1 pint snow peas, and a small bunch each of dill and cilantro. I'm stockpiling the garlic scapes so I can pickle them - last year I made pesto and then froze little bags of it (more on that in a minute) and then just chopped the scapes and froze those, too. This year, since I still have some of all that in the freezer, pickling them seems like a nice idea. I might roast the turnips, if we don't eat them raw in the next few days. I made my own version of maast-o khiar: I mixed 1 package of the garlic scape pesto into 3 cups of yogurt (I made another gallon the other day, this is one container out of 6) and added chopped, peeled cucumbers. It's a little too garlicky so, when I got home from the farm, I tossed in some fresh dill. Maybe it needs salt and pepper but I'll wait until we eat it to figure that out. We'll have it for dinner with lamb chops from that spring lamb share, pita bread, and some raw snow peas and strawberries. Sounds like a lovely dinner to me! Today, I got brave enough to pull out a comb and inspect it. 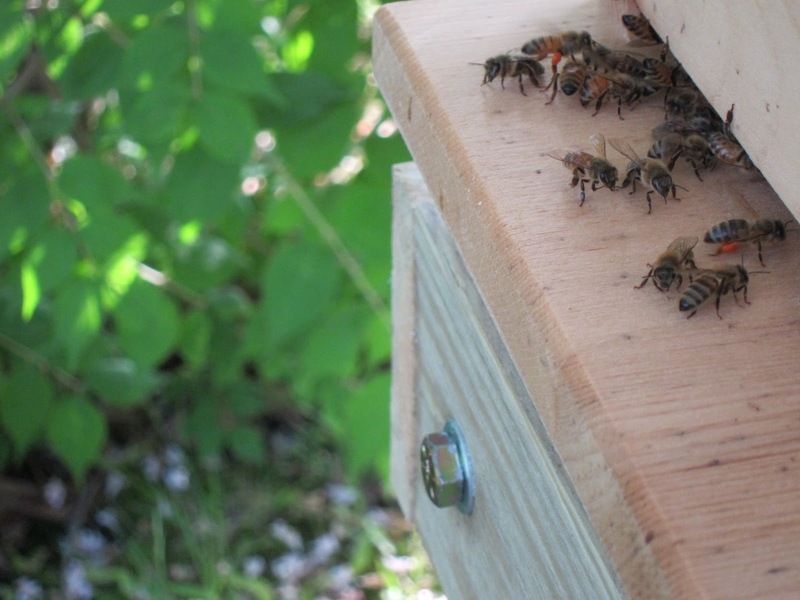 There was honey, and nectar, and capped drone cells and capped worker bee cells. Obviously, the queen is doing well. It's very exciting! Also on the agenda tonight, after dinner: canning that chicken stock and making a batch of yogurt (so it can grow overnight). 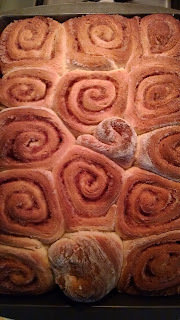 The other day, my husband informed me that the 10 year old had discovered my bread cookbook and came to the realization that I had a recipe for cinnamon rolls and had yet to make any. This was, as you can imagine, quite upsetting. Why had I been holding out, the 10 year old wanted to know. I promised that we would find a time to make them together. We made a date for today, after school. While school was in, however, I had about 3 or 4 projects of my own to take care of. I started with making 14 pints of chicken stock, using all the chicken bones I found in the freezer (three chickens). I will can this tomorrow, right now the stock is being chilled so I can remove the fat. I also made a batch of pickled radishes, using the recipe in my book "Preserving by the Pint." Instead of using Daikon radishes, I used regular red ones as I was fairly inundated and I'm the only one, really, who eats them. When I went outside to take the picture of the radish pickles, there was an oriole in my garden! 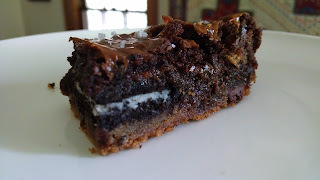 One of the nurses at work had asked when I was going to bring in more treats so I made brownies - the kind with the chocolate chip cookie dough, oreos, dulce du leche, and brownie batter all layered in a pan. When they came out of the oven, I drizzled them with the last of the dulce du leche and sprinkled them with coarse finishing salt. Also, I started marinating steak and venison in soy, garlic, ginger and sherry for this evening's stir fry. Then I went to check on the bees. They were busily bringing in pollen and those younger bees were washboarding again. I have decided that, whatever washboarding is for, it is the scut of the bee world and the most junior are the ones who have to do it. Like interns. Eventually they will graduate to some other task. Anyway, I took a video of them while they were doing their little washboarding dance. Speaking of bee dances, I peeked through the window and happened to catch a bee doing the "wiggle dance" they do to tell other bees of a good source of food. It was pretty cool to watch - she was on the edge of a comb and shaking so much she was blurry. Then she moved to a different spot and did it again. 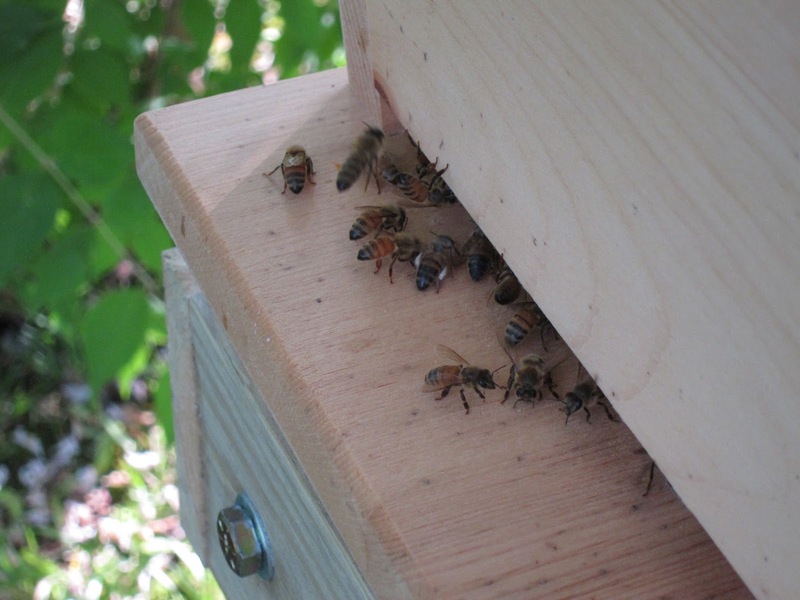 Sure enough, shortly after, there was a larger number of bees leaving the hive than previously. How cool! After the 10 year old got home from school, we made the cinnamon rolls. I am pleased to say my kid did most of the work. 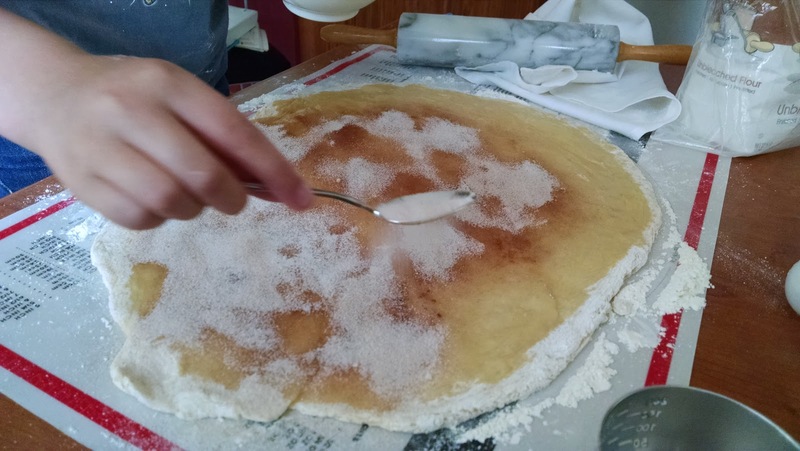 Kneading was almost as much fun as sprinkling sugar and cinnamon (mostly) on the dough. Once those were done, my 13 year old made the stir fry for dinner. First the beef and venison was fried, then taken out of the wok so the Napa cabbage, scallions, and komatsuna greens could be sauteed. They were also removed, and the rice noodles were fried in the wok with a sauce of soy sauce, chicken stock, cornstarch, 5-spice powder and white pepper. They only needed to be cooked a few minutes and then everything else got added back to get coated in sauce. Dinner was really tasty - the venison was more tender than the beef, which was a nice surprise. 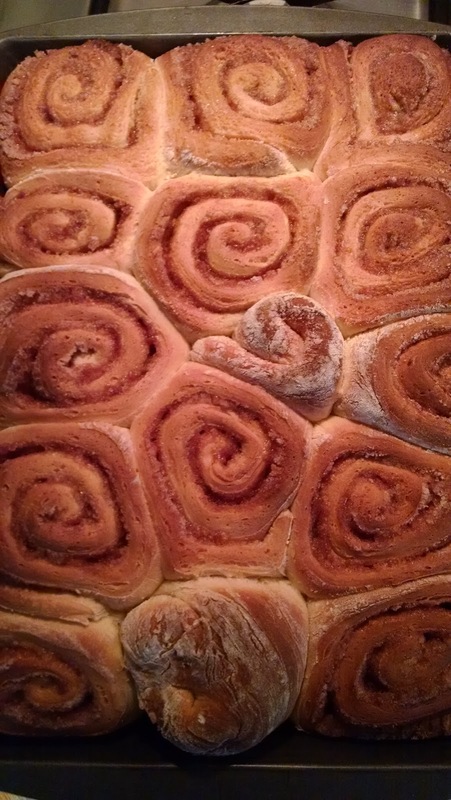 For dessert, we ate those cinnamon rolls! The farm share distribution started today - a little late due to the late start to Spring. It's so nice to be back out there! 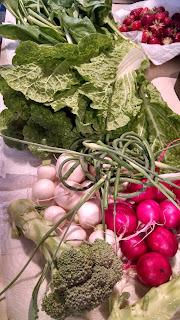 Given that it was the first week, the amount of food was more than expected: Napa cabbage, broccoli, a bunch each of radishes and Hakurei turnips, 12 garlic scapes, a pound of komatsuna greens, and 2 pints of strawberries. For dinner we had a big salad with some of the radishes, turnips and strawberries, as well as goat cheese. I made another champagne vinaigrette for the dressing, this time I added a little fresh parsley and some cayenne pepper for a little extra kick. Tomorrow I plan to have a stir fry with the cabbage and the komatsuna greens and some beef and a little venison - I have random individual servings of various meats in the freezer that should be eaten and I've been looking for ways to use them. This seems like a good plan. 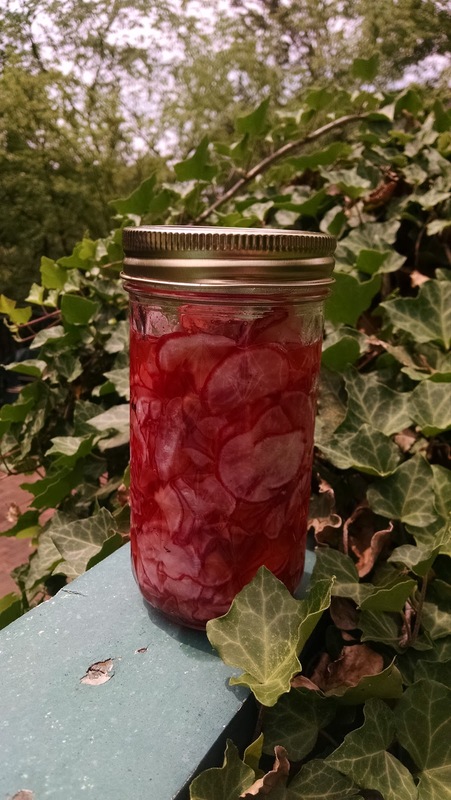 Also tomorrow I might pickle some of the red radishes! Here are a few photos of bees returning to the hive with pollen! Two bees returning with red pollen. The bee with the red pollen fell over when it landed! Another bee with red pollen. Here's a bee with white pollen! 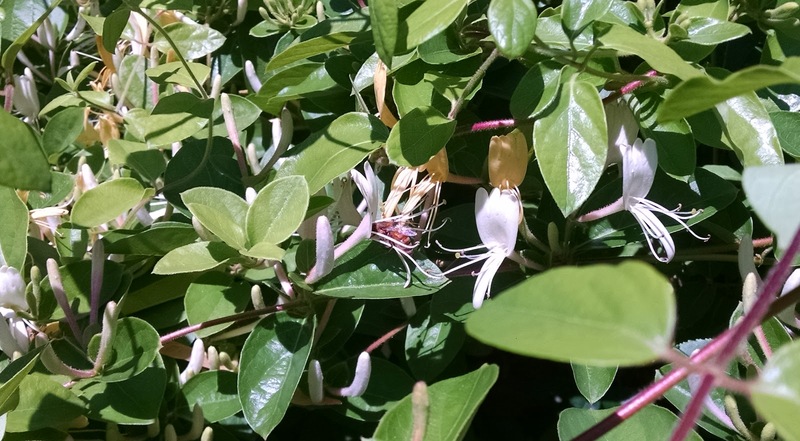 A side note: while I was taking these pictures, I noticed the bees in the doorway were doing something weird. They were rocking back and forth and seemed to be licking the wood. The other bees came and went but these ones stayed put. 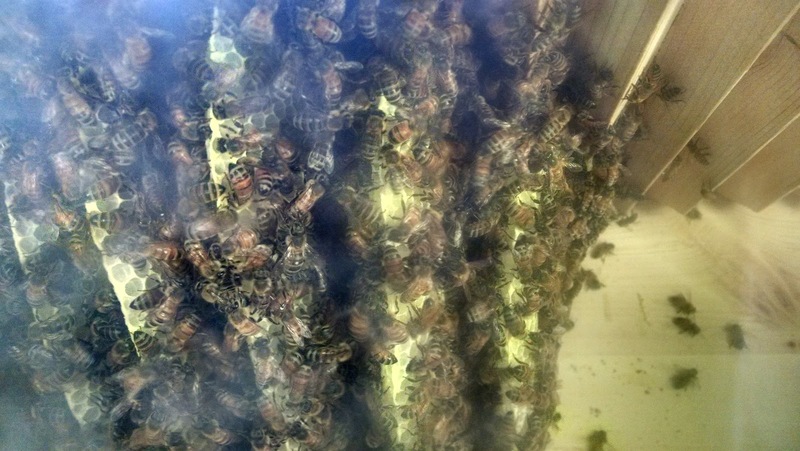 If you look closely at the photos, some of the bees have their tongues out. I did a little research and discovered that this activity is called "washboarding" and is primarily done by adolescent bees. It was very strange but I'm glad to know it is normal. Today, after work, I had a little time to get some yardwork done and then I went out to check on the bees. I'd been able to leave them to their own devices these past few days because the weather has been good, and I wanted to take out the feeding bowl and the empty queen cage. 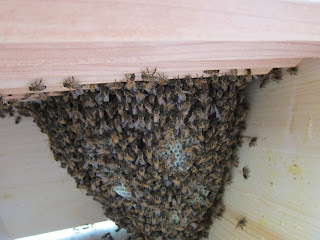 While I was there, I stuck the camera into the hive and took a few pictures. Clearly, they are making progress. I wasn't about to pull out a comb and start examining it so I don't know whether or not there are the beginnings of a brood in there somewhere. I certainly hope so! The front of the hive is to the left in the photo. Anyway, I removed the bowl of honey water that had a few bees on it, but I hadn't refilled it since Tuesday and there was still some there, so it seemed like they didn't really need it anymore. There were a lot of dead bees in the bowl, I guess they drowned in honey. I suppose there are worse ways to go. In other news, I brought a jar of strawberry rhubarb jam to the nurse who brings me eggs, and brought home a dozen local fresh eggs to enjoy. Always a good deal! Yes, I did say I was going to wait until Thursday to move things around in the hive but I figured the earlier I did it, the less disruptive it would be. I got home from work at a reasonable time, it finally stopped raining, and it's starting to warm up slightly. 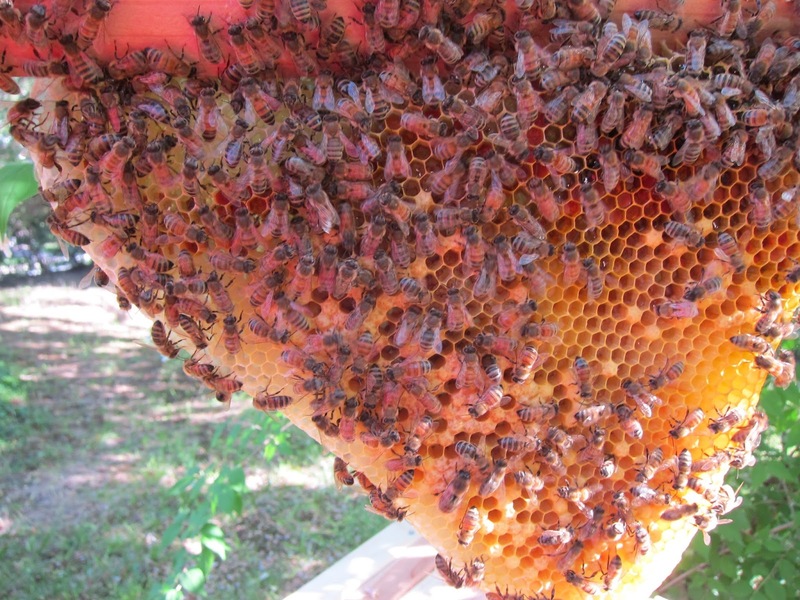 When I went to the hive I had the intention only to feed them and leave them alone, but they hardly ate any of the food I'd put in yesterday and the comb was progressing nicely so it seemed okay for me to go ahead and release her. The instructions did say in 3-5 days, after all. The bees were fairly active, starting to come out of the hive again. After some consideration about the bees-in-sleeves problem, I hit upon using long surgical gloves into which I could tuck the cuffs of my overalls. The gardening gloves fit over the surgical gloves and all this allowed for some extra protection. It worked quite well. Although, at one point, my shoe and sock were COVERED with bees, but they didn't sting me, and I managed to brush them off after a little bit. I slid the combs forward to the front of the hive, as instructed from the information I got from Back Yard Hive, and moved the false back to the actual back. 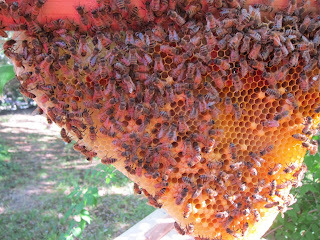 Once I finally got everyone settled, I moved the feeding dish a little bit back away from the combs, and released the queen. She didn't seem to want to get off of her box, so I left the whole thing in the back of the hive and I'll take it out later. By the time I get back in there, in a few days, she should be busy on the comb. Hopefully, at the same time I'll be able to remove the feeding dish. Now I'm going to leave them and let them do their thing. I should be checking on them every few days, but just through the window whenever possible. 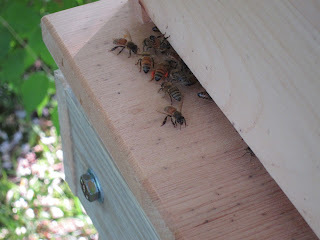 Day three of Bee Guardianship and things were not as easy as they had been. There were some good things along with the challenges, though. 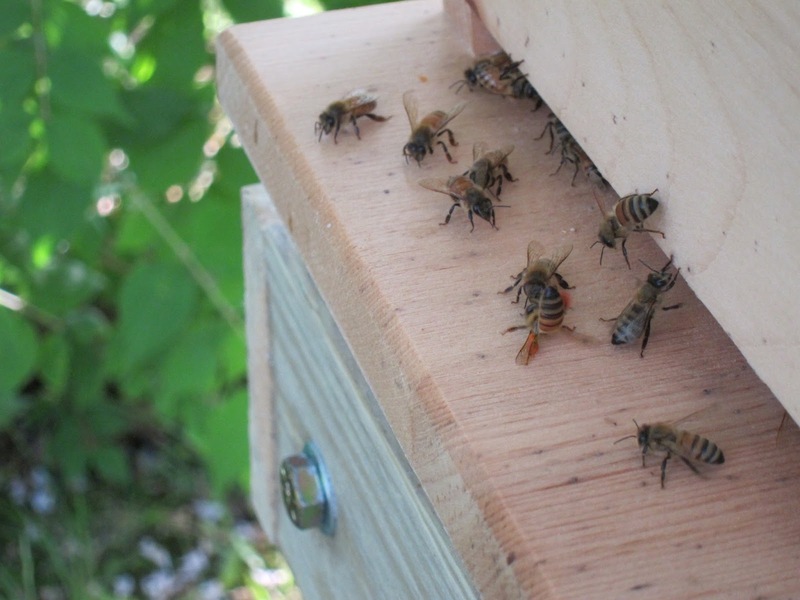 The day I introduced the bees to the hive was beautiful, sunny and warm. And then it started to rain yesterday and hasn't been above 55 degrees ever since. I fed the bees twice yesterday and, today, when I got home from work, went out to feed them again. Here is the good news: there is the beginnings of a comb being built. That's very exciting! In a few days (Thursday) I will make sure the queen is out of her cage and move some of that comb up a few bars. However, the bad news is that by checking that comb, a whole lot of bees came out between the bars and it was hard to get everything back together without squishing any of the bees. I tried to be patient, but there was honey water on my gloves, I think, so they kept landing on my gloves and not wanting to get off. And then one, maybe more, got into my sleeve. I did eventually get stung. What I did was step away from the hive, remove the veil, gloves and took my upper body out of the overalls. I shook out the bees, removed the stinger from my arm, and sprayed the area with alcohol. It didn't really hurt, just a tiny pinch. After I got dressed again, hoping there weren't any other bees inside my clothing, it took me maybe 20 minutes to close up the hive. I had a few stragglers on my clothes when I got back to the patio, so I carried each of them back to the hive, but they seemed to be dying. My husband thinks maybe they tried to sting me through the overalls and were dying because of that? I don't know. Every time a bee dies and I think it's my fault, I get bummed out. I know there are thousands more but, still. Hopefully in the next day or so it will warm up again, and then they can start to forage and then I won't have to feed them as much anymore. And the other good thing? I didn't freak out, even after I got stung, even when I could feel bees crawling up my arms. Every instinct was to wave my arms like a windmill and shriek. I mean, there were bees up my sleeves. Maybe I'm getting the hang of this.